Whether you are sipping or soaking, summer is the perfect time to remember the amazing properties of lavender. Universally regarded as one of the most healing of all herbs, lavender calms the nervous system and reduces mental stress. For tea drinkers, it’s often paired with chamomile or rose in herbal blends and also lends itself to popular caffeine blends like Lady or Lavender Earl Grey and Jasmine Harmony. It’s easy to experiment – just add lavender blossoms directly to your favorite tea leaves before brewing. Note: A few blossoms go a long way. Or make an easy Lavender Infusion and use it for everything from spa baths to lemonade. Make your own magic like the Lady Martini shown here that I created a few years ago. Perfect for soft, summer evenings. Recipes below … enjoy! Combine 1/2 cup of fresh lavender blossoms with 4 cups of boiling water. Let steep for 18 – 20 minutes. Strain liquid. Keep infusion in a sealed glass jar away from light. Use for a variety of applications such as a relaxing bath and room/laundry spray. Add to black, green or herbal tea for a fragrant treat. Mix with fresh squeezed lemons and sugar to create beautiful lavender lemonade (see below). Mix 2 shots Lavender Lemonade (made by blending juice of six lemons, 3/4 c sugar and 2 cups of Lavender Infusion) with 1 shot Vodka and 1/2 shot Cointreau. Shake with ice, strain and pour. 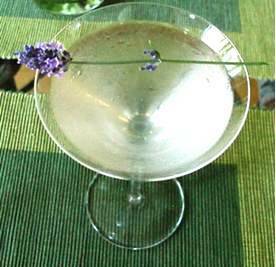 Garnish with a sprig of lavender.